Pulmonary arterial hypertension associated with congenital heart disease (PAH-CHD) is a common associated form of PAH . Riociguat, a soluble guanylate cyclase stimulator, was shown to be a safe and effective treatment for patients with PAH in the Phase III PATENT-1 study and the PATENT-2 long-term extension [2, 3]. Here we report data for the subgroup of patients with PAH-CHD in PATENT-1 and PATENT-2. 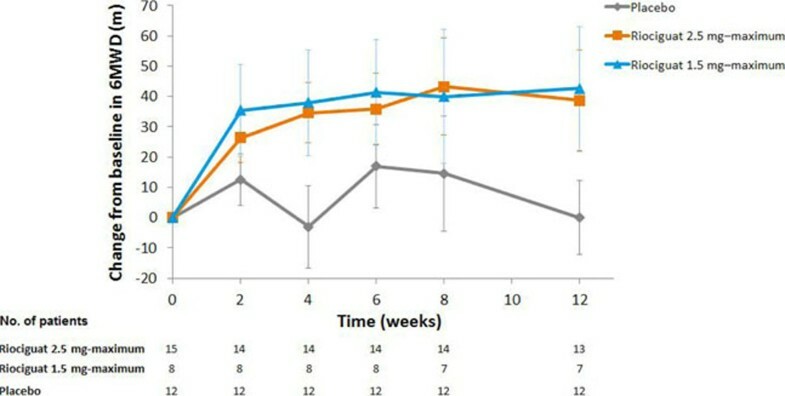 In PATENT-1, adults with symptomatic PAH were randomized to receive placebo, riociguat up to 2.5 mg three times daily (tid) or riociguat up to 1.5 mg tid (exploratory) for 12 weeks. 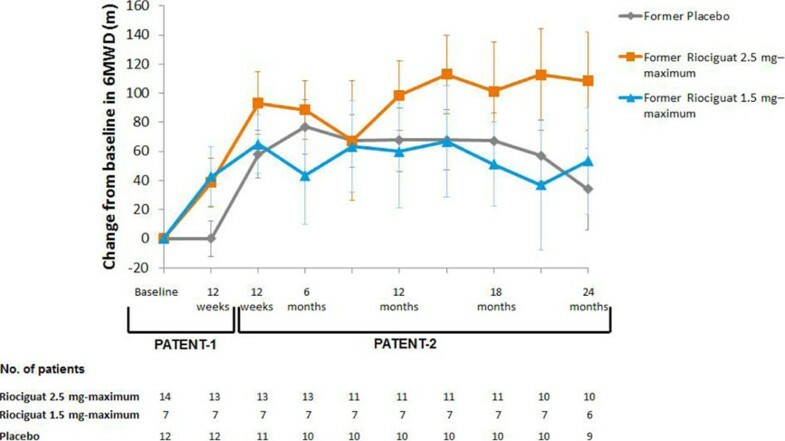 Patients completing PATENT-1 without ongoing riociguat-related serious adverse events (AEs) were eligible to enter the PATENT-2 long-term extension, during which all patients received open-label riociguat up to 2.5 mg tid. There were 35 patients with PAH-CHD in PATENT-1. All had persistent/recurrent PAH following complete surgical repair of CHD. Mean time since last corrective surgery was 16.8 years. At baseline, 57% of patients were treatment-naïve and all were in WHO FC II (60%) or III (40%). At Week 12, 6MWD (primary endpoint) had increased from baseline by mean±SD 39±60 m in the riociguat 2.5 mg–maximum group and by 43±54 m in the 1.5 mg–maximum group and was unchanged with placebo (Figure 1). Several secondary endpoint, including PVR, NT-proBNP and WHO FC, also improved from baseline in both riociguat groups (Table 1). Of 35 patients with PAH-CHD in PATENT-1, 33 entered PATENT-2. The improvements in 6MWD with riociguat seen in PATENT-1 were sustained for up to 2 years; 6MWD also increased in the former placebo group after transition to riociguat (Figure 2). At 2 years the overall mean±SD change from PATENT-1 baseline in 6MWD in PATENT-2 was +68±97 m and WHO FC had improved/stabilized/worsened in 32/60/8% of patients (n=25). In PATENT-1, the most commonly reported AEs (occurring in ≥15% of PAH-CHD patients in any treatment group) were dyspepsia, headache, dizziness, palpitations, back pain, nausea, vomiting, chest discomfort, dyspnea and pain in extremity. Six serious AEs were reported in these patients in PATENT-1: intra-abdominal hemorrhage (one riociguat 2.5 mg–maximum patient); right ventricular failure and worsening PAH (separate events in one 1.5 mg–maximum patient); loss of consciousness (one placebo patient); pneumothorax and supraventricular tachycardia (separate events in one placebo patient). None of these events were considered related to study drug. No new or unexpected safety signals were observed in PAH-CHD patients in PATENT-2. Data are mean±SD unless otherwise indicated. a Data missing for one patient. This exploratory subgroup analysis showed that riociguat improved clinical outcomes and was well tolerated in patients with persistent/recurrent PAH following complete surgical repair of CHD.